GZ-HM550 features built-in Bluetooth® Wireless Technology. In combination with optional devices, you can enjoy a variety of wireless applications. 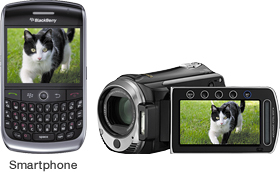 With a compatible smartphone, you can control the camera's basic operations such as record, zoom, or playback, remotely. 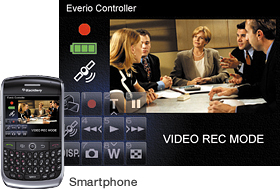 You can transfer still images from Everio to a compatible smartphone, with no cables attached. Makes it easy to carry your favourite images. With a GPS unit, you can record location data on movie files. 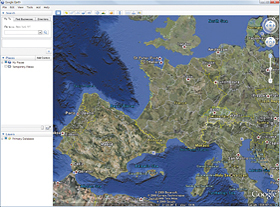 Those files synchronize with Google Earth™ when playing back with Everio MediaBrowser on a PC. 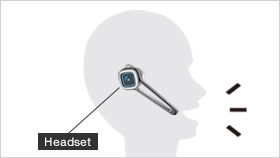 With a compatible headset, you can monitor sound while shooting or record your own voice. Note: Works at a distance of up to 11 yards/10m (approx.). Depending on radio wave activity or physical obstructions in your surroundings, or characteristics of the product you are using, communication may terminate abruptly, headset audio quality may degrade, or communication distance may become reduced to under 11 yards/10m.